This combination photo shows Nicki Minaj, left, and Cardi B at the Harper's BAZAAR "ICONS by Carine Roitfeld" party at The Plaza in New York on Sept. 7, 2018. 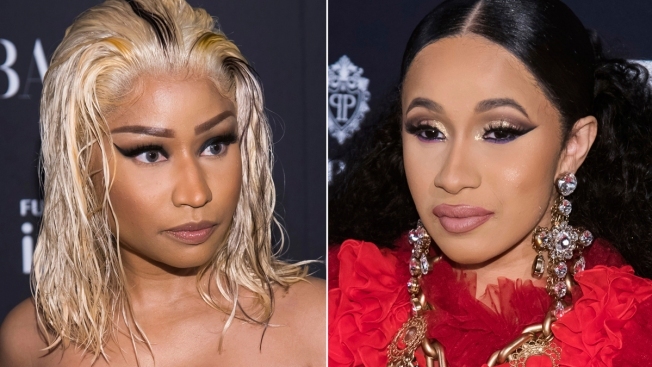 Minaj says being involved in an altercation with Cardi B at a fashion week party was “so mortifying and so humiliating.” Cardi B tried to attack Minaj at Harper's Bazaar Icons party in New York on Friday. Video circulated on social media showing Cardi B lunging toward Minaj and throwing her shoe at the rapper. Nicki Minaj said being involved in an altercation with Cardi B at a fashion week party was "so mortifying and so humiliating." Cardi B tried to attack Minaj at the Harper's Bazaar Icons party in New York on Friday. Video circulated on social media showing Cardi B lunging toward Minaj and throwing her shoe at the rapper. In an Instagram post, Cardi B — who recently had a child — didn't call out Minaj by name but alluded to the fight and said she was sparked because her mothering skills were being disparaged. The rappers have been rivals since Cardi B began achieving huge success over the last year. Cardi B recently became the first female rapper to have two songs hit the No. 1 spot on the Billboard Hot 100 and her debut album, "Invasion of Privacy," is one of the best-selling albums of the year. Minaj continues to find success but has been displaced as rap's top female act. Minaj said on her show that Cardi B "has built her career off of sympathy and payola."